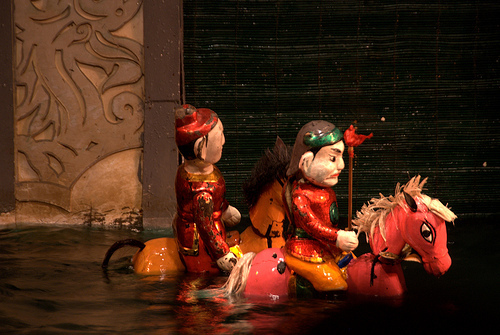 Water puppetry (Vietnamese: Múa rối nước, lit. 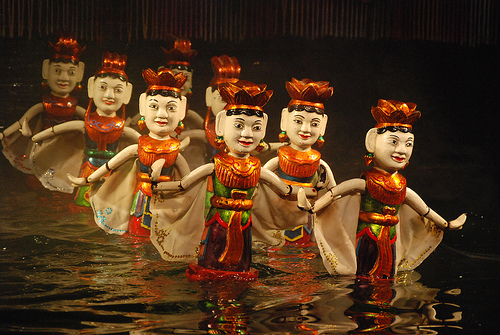 “puppets that dance on water”) is a tradition that dates back as far as the 11th century CE when it originated in the villages of the Red River Delta area of northern Vietnam. Today’s Vietnamese water puppetry is a unique variation on the ancient Asian puppet tradition. The puppets are made out of wood and then lacquered. The shows are performed in a waist-deep pool. A large rod supports the puppet under the water and is used by the puppeteers, who are normally hidden behind a screen, to control them. Thus the puppets appear to be moving over the water. 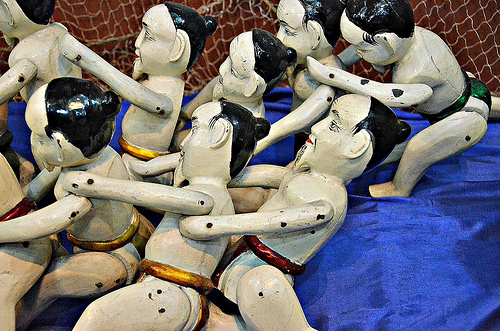 When the rice fields would flood, the villagers would entertain each other using this form of puppet play. Later, interest in water puppetry expanded under the explosion of arts encouraged by the Tran Dynasty. 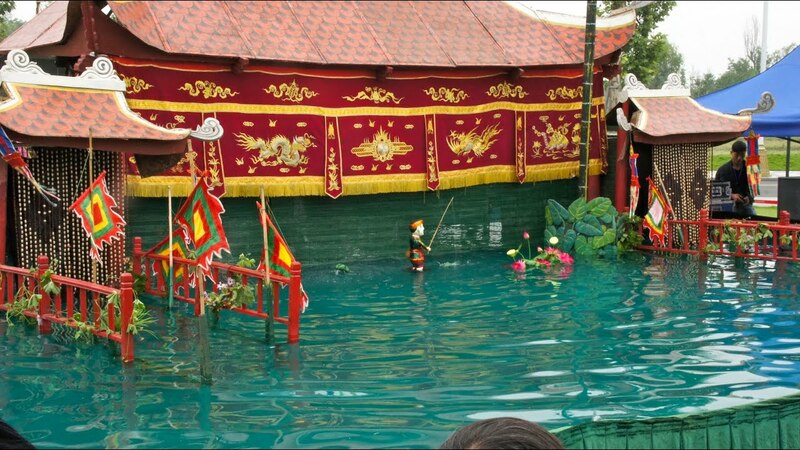 Although considered an art-form of the “village pond” (or, of the common people), water puppetry shows were per formed at royal celebration such as the crowning of a queen or the birthday of a king. Water puppetry is performed in the open air using a pond as the stage. The audience sits in front of the stage on the water’s edge. Standing waist deep in the water, the puppeteers, or manipulators, deftly control the wooden puppets from the concealed manipulators room with rods, wires, and strings hidden under the surface of the water. The pond is not only a natural setting for blending illusion with reality; the water also amplifies stage sounds for a natural stereo-phonic effect. Nearby trees, the blue sky, and the occasional passing cloud are reflected in the water, adding enchantment to the liquid stage. 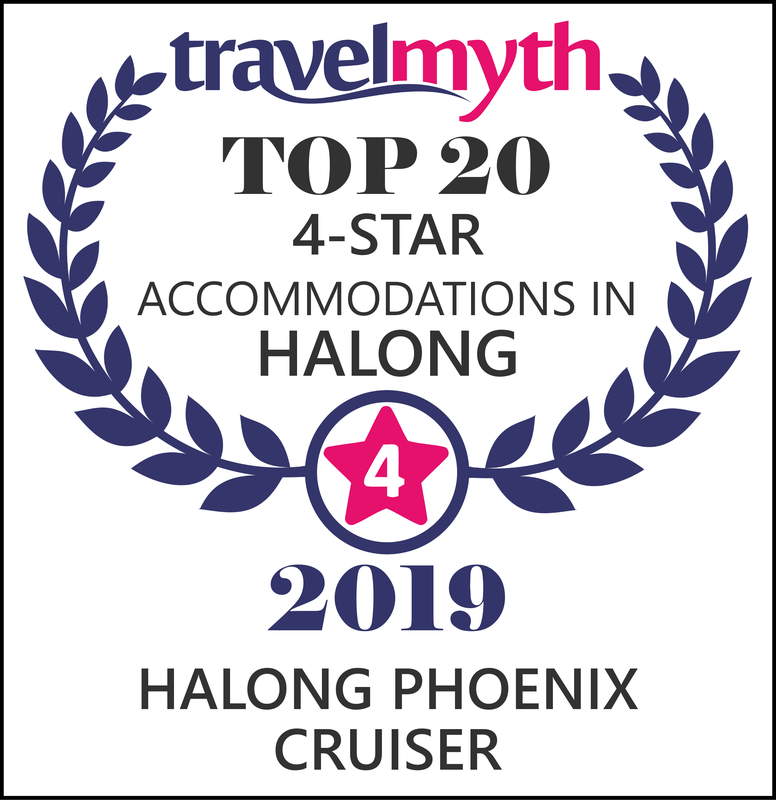 In the hands of master manipulators, stiff, lacquered wooden puppets, about 45 to 90 centimetre’s high, are magically transformed into graceful characters that walk on the water. Puppets appear un-expectedly from the aquatic stage and then, just as suddenly, disap-pear in a flash to the delight of the audience.